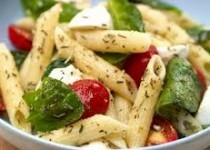 This recipe is delicious warm or cold and very accepting of personal variations, such as the addition of olives. 1) Boil penne pasta until a la dente, drain (do not rinse) and return pasta to pot, cover with pot lid. 2) Add 1 cup of Super Garlicky Bread Dipper w/ Blue Cheese (at room temperature - shake well before pouring into measuring cup), blend lightly. 3) Add chopped spinach and tomatoes to pot, keeping covered. 4) Add fresh herbs, feta cheese and feta juice. Toss well. Note: If eating same day do not refrigerate. Keep covered to allow warmth to marry flavours. 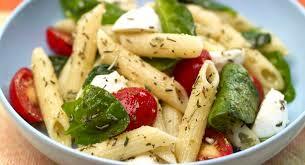 Adjust seasoning before serving; pasta may need more Super Garlicky Bread Dipper w/Blue Cheese or olive oil.